This is probably less of an issue for Americans (right) than the British (left) – I presume that other Europeans will have the same issue. Certainly, this will result in some squashed looking calendars on certain months. 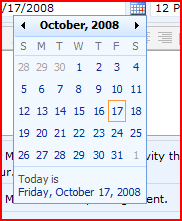 Yet try as I might, I couldn’t get the calendar to fill an entire area. And why does the American format give the day and the normal format not? : What defines the width of this control? Na, it was the Day, Month, date and year at the bottom for US region sites, but the Month and Year in the title for UK region ones! 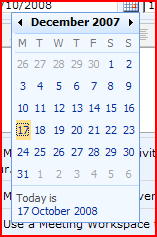 I did try fixing the width, but it never looked remotely right – large gaps on either side of the calendar part, etc.. It was a real pain! Have you found the solution to fixing the width of datepicker for all months? 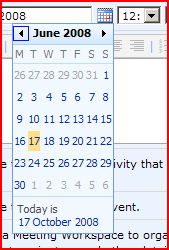 I have 2 sharepoint sites and both have identical datepicker.css, but one displays fixed width datepicker whereas the other displays datepicker that varies its width for different months. Hmm – wierd that one is fixed and the other not. I take it that they’re using the same CSS – as Marc says, you could use a fixed width, but I found that fiddly (i.e. it was going to take longer than it was worth worrying about). So I guess the short answer is no, I never did get any further.